The two-week Transformational Author Experience is over and I am grateful that I was able to listen to several powerful and learned people who were willing to share their experiences. It left me with mixed feelings about becoming an author. I admired the great speakers, especially the writers who shared their wisdom about the craft of writing. But then it got all muddled up for me…and I don’t know if it’s because I have embraced a Zen-inspired life, or maybe I’m simply an introvert. But all the stuff about promoting and marketing, social media, building an author’s platform, and learning how to be a speaker, made me feel like crawling into a cocoon. It was great learning though, and I am grateful that I was able to listen to Christine Kloser, Panache Desai and Mark Matousek talk about the process of writing a book. Seriously, when I realized how much work today’s authors have to do – that they have to wear many hats after finishing their book, I said I would probably never write a book. Today’s writers have to be marketing and social media experts as well – and that’s a problem for someone who is fazed by Facebook. The only reason why I have tweets is because WordPress.com conveniently tweets my blog posts. Admittedly, taking on a marketing persona is not among my priorities. Both Kloser and Matousek advised writers to protect their book. Showing the first few pages of your first draft is a no-no, according to the two authors. I still have my reservations about the marketing and social media aspects of writing a book, perhaps even more so after realizing how much work is demanded from authors after their books are published. 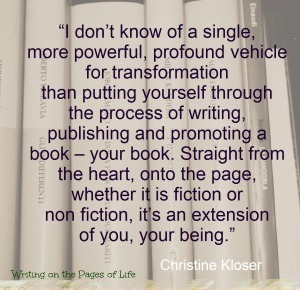 But I must admit that after hearing Kloser and Matousek discuss the transformative power of writing a book, I did some serious thinking. And I’m still thinking about it…. A terrific post as always thank you ! Reading today’s advice on publishing and the alleged requirement to do and be as they suggest dumbfounds me. As per stories about famous writers in Chicken Soup for the Writer’s Soul, you can write for yourself; self-print a few pages / books and sell or give away and you are an author. You can sell on Etsy, to your local libraries, to friends, family, local schools. You can set up a stall at a market. You can go door-to-door to local bookstores (the few that remain). You can create beautifully scribed poems and offer them to cafes. Our options are endless. Write what you love and do it beautifully for yourself. My main advice would be to subscribe to Writers Beware blog: fascinating stuff and completely puts me off traditional markets. May the power of words return to the Word Artists ! Thanks for the advice, Renata. I will certainly check out Writers Beware. The recommendations from writers featured in Chicken Soup for the Writer’s Soul are creative and non-traditional, but oh, for someone who has a day job, it still seems a lot of work. Anyway, perhaps first things first. Write the first draft and see where it leads…. Don’t worry about the other stuff ~ focus only on writing. That’s it. Nothing more. Sage advice about guarding your work from Kloser and Matousek. Thank you for sharing. Those are some great points about overcoming “writer’s block.” I’ve read that sort of advice before, but I’ve never seen it articulated quite like that. Whenever I’ve tried to freewrite my way out of a sticky spot, it’s felt like a bit of a struggle, and I think that’s because my efforts have been more directed towards clearing away the smokescreen rather than focusing on myself while the smokescreen dissipates of its own accord. Thanks for the great post! I hope you’ll be able to focus on yourself the next time you feel blocked. So many writers do not believe in writer’s block, neither do I. It’s a myth that we’ve all been led to believe exists. Thanks for dropping by and taking the time to comment. Next PostWhy Write a Book?